Karl Fischer (KF) titration is a widely used technique for moisture or water determination in solid, liquid and gaseous samples. It has a host of applications in industrial quality control. What is Karl Fischer Titration and How Does It Work? What is the Difference Between Coulometric and Volumetric Titration? What is the Difference Between Titration and Karl Fischer Titration? 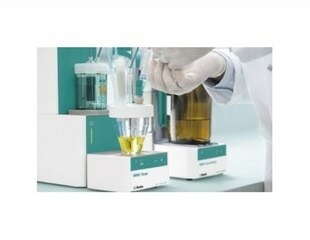 Metrohm expands the OMNIS Titration Platform enabling users to perform volumetric Karl Fischer titrations. The OMNIS Karl Fischer Titrator addresses the needs of users for ease of use and protection from solvents and reagents with a whole range of innovative features. Automating volumetric titration in whole series of samples used to be a challenge: Firstly, there is the risk of ambient moisture compromising sample integrity, and secondly, there is the necessity to start the titration in due time for each sample. No other industry is as thoroughly regulated as the pharmaceutical industry. The active ingredients are legion and so are the standards to test for them. Metrohm is the market leader for ion analysis. Analytica is the most important trade show for us on a global scale. Chemists at The University of Texas at Arlington have invented a method to quantify water content in solid pharmaceutical drugs that is faster, cheaper, more accurate and more precise than Karl Fischer titration, the method currently recognized by the U.S. Food and Drug Administration and widely used worldwide. Honeywell today announced that it has completed the acquisition of the Seelze, Germany-based laboratory research chemicals business from Sigma-Aldrich, broadening Honeywell's offerings for high-purity solutions for drug discovery, medical diagnostic testing and other laboratory applications. Honeywell (NYSE: HON) today announced that it has signed a definitive agreement to acquire the Seelze, Germany-based laboratory research chemicals business from Sigma-Aldrich for approximately 105 million euro.